This applies to areas where penguin colonies are not present, eg Knyna, Plettenberg Bay, Tsitsikamma, Buffalo Bay. Penguins come ashore for various reasons. 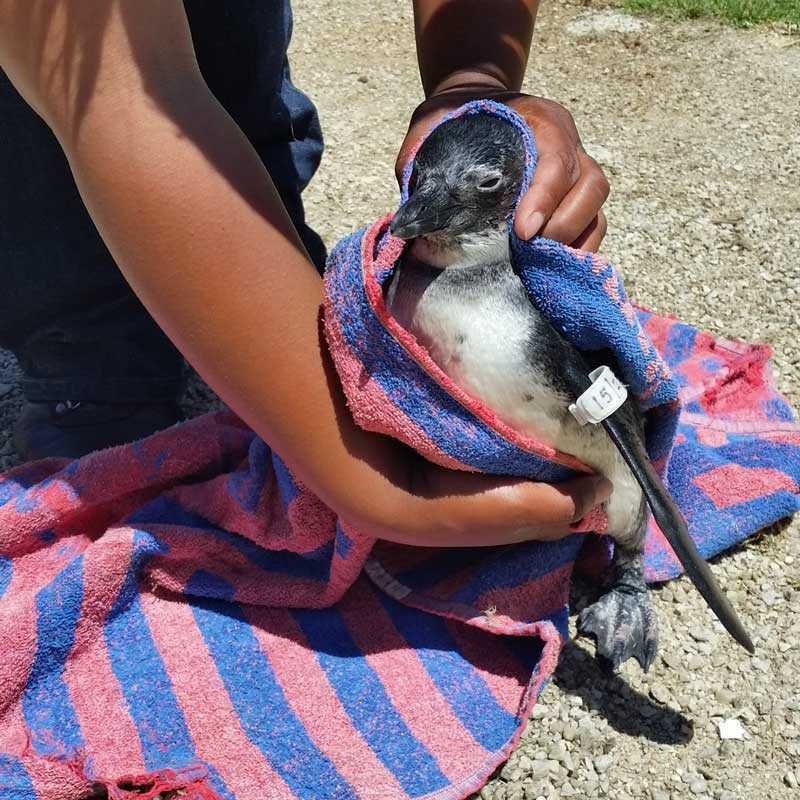 Because of the endangered status and declining numbers, all penguins that come ashore in places other than their land-based colonies (Stoney Point, Boulders and Betty’s Bay) need to be removed from the beach and sent to an approved rehabilitation centre for assessment. Under no circumstances should a penguin be chased back into the water. If you come across a single penguin on the beach, wrap a towel around the penguin and over its face. Pick it up being careful not to get pecked in the face or arms. 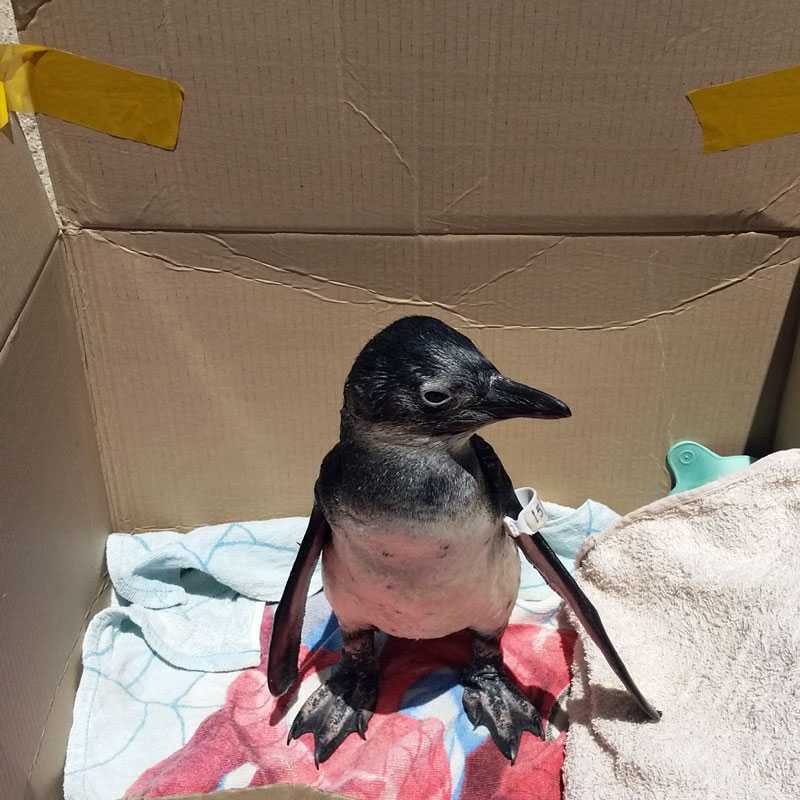 Put it in a box about 3 times the size of the penguin with reasonably tall sides, lined with a dry towel and bring it to the rehabilitation centre asap or drop it off at Cape Nature Offices or a nearby vet. Do not try to feed it anything or give it water. Penguins need to be taught how to eat fish in a rescue situation. Forcing it to eat whilst it is weak and hyperthermia could kill it. Penguins that are rescued from the shore need to stay warm (just slightly warmer than room temperature and dry until you can get it to an approved rehabilitation centre. Do not put it in the bath or shower or think you need to keep it wet. 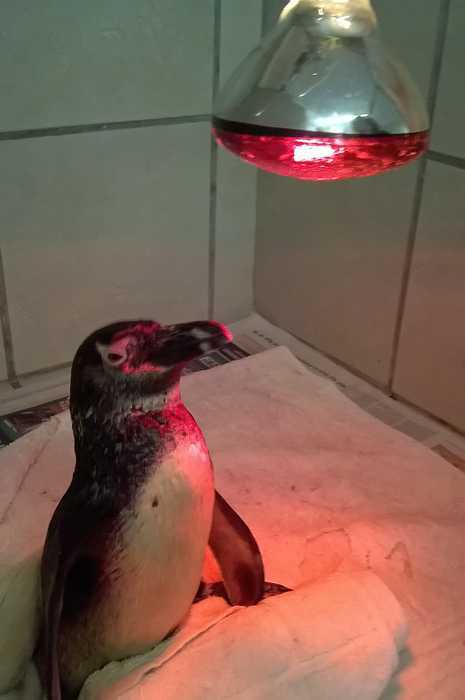 If you have a hot water bottle available, fill the bottle with boiling water, wrap in a towel and place it next to the penguin making sure that the penguin can move away from the heat if necessary. Make sure that the penguin is not constrained in any way, so that it can breathe, and that the box is adequately aerated. Penguins undergo an annual moult where the old feathers fall out and are replaced by new feathers. This is a normal, natural process taking approximately two weeks during which time they are not fully water-proof and remain on shore until they have groomed oil through their new plumage and are fully insulated against the cold water. During this time, they are particularly vulnerable to dogs, people and predators. They are removed from the beach, and according to a strict set of protocols followed by all rehabilitation centres approved to conduct penguin rehabilitation, they are dewormed, checked for blood parasites, and when they have picked up sufficient weight and waterproofing, are released back to the sea. Prior to their moult, penguins bulk-feed to carry them through the moulting period. If they are unable to gain sufficient weight, sometimes the moulting process falters and stops. The penguins cannot return to the sea in this state, will dehydrate and starve to death on the shore. These “arrested moulters” have a typical dried out brown appearance. 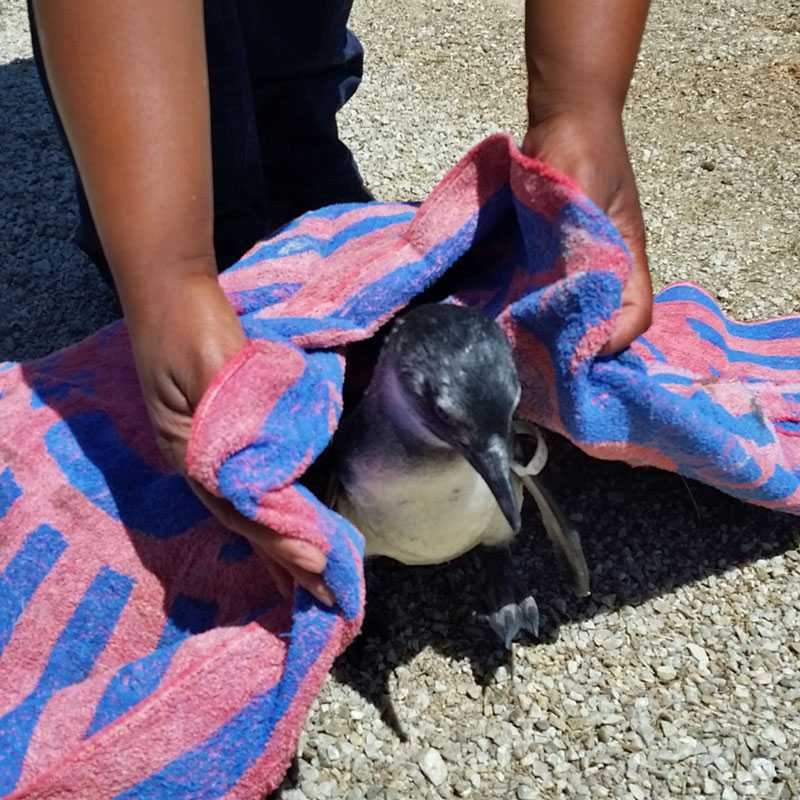 They are removed from the beach, and according to a strict set of protocols followed by all rehabilitation centres approved to conduct penguin rehabilitation, they are fed with additional supplements to kick-start the moult process and rehydrated and supportive fed. As part of their stay in rehabilitation, they are dewormed, checked for blood parasites. Once the moult process has completed and when they have picked up sufficient weight and waterproofing, they are released back to the sea. African Penguin colonies mostly occur on the islands near the southern tip of Africa. The environment in these breeding colonies has deteriorated for many reasons (pollution, guano harvesting, over-fishing, imbalance leading to excess vermin and predation). African Penguins have become vulnerable to a host of diseases such as Avian Malaria and Babesia (tick-bite fever). Penguins suffering from these blood-born diseases will die if they are not treated. They are weak, lethargic and anemic, and are so exhausted that they cannot swim anymore and crawl ashore. They are removed from the beach, and a blood smear is taken to confirm a positive diagnosis. They undergo treatment which lasts approximately 2 weeks as they are nursed back to health. As part of their stay in rehabilitation, they are dewormed, and once they have been given a clear bill of health, they are released back to the sea. 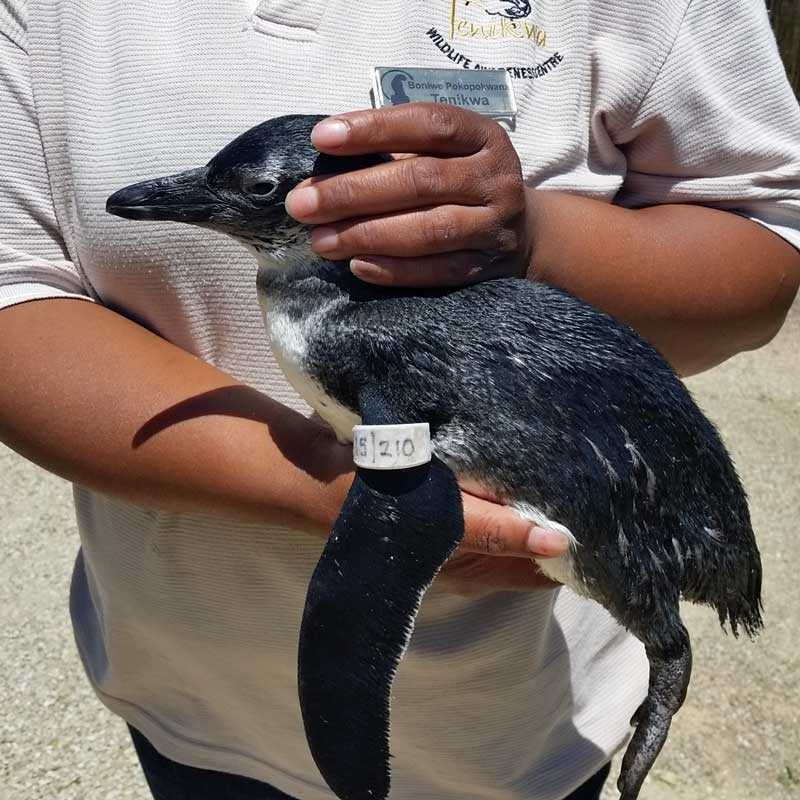 African Penguins may also get injured at sea from a variety of causes such as natural predation by seals, sharks, orca’s, and man-made injuries such as propellor blades, fishing tackle, plastic and pollution. If they come ashore, it means that the injury is serious enough for them to require treatment. Whilst their wounds are being treated, as part of the rehabilitation process, they are dewormed and routinely checked for blood parasites and when given a clean bill of health, they are released back to the sea. 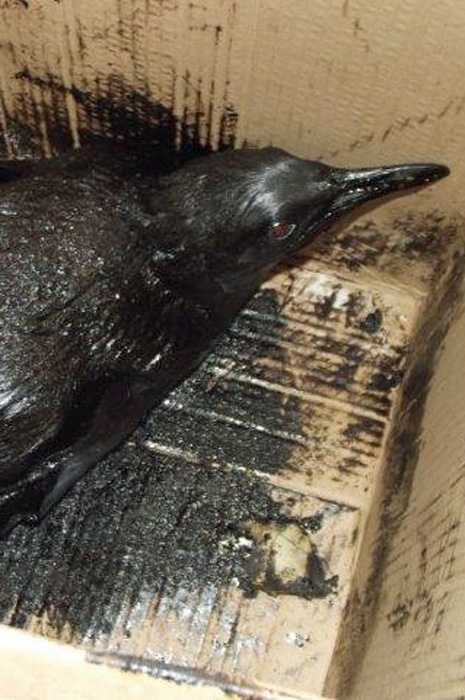 Penguins like other marine species are affected by oil spills and unacceptable practices like dumping vessel bilge water (water containing oil, detergent, urine, diesel) overboard. They can swim through a small pocket and become coated in the concoction which sticks to their feathers and affects their water-proofing. 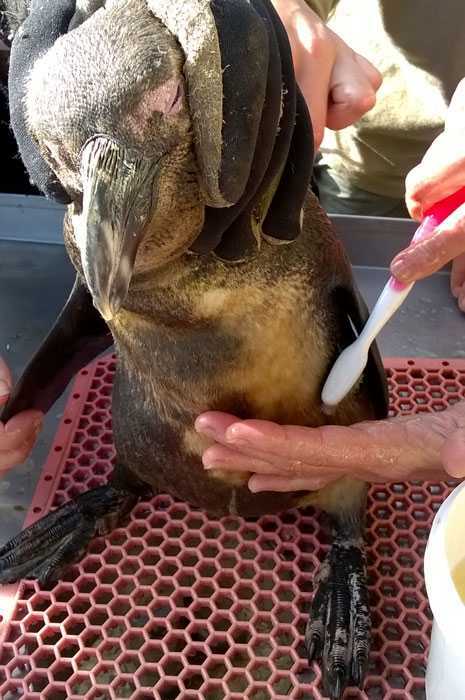 These penguins have to undergo a very traumatic washing process to remove the oil, and then they remain in rehabilitation until their water-proofing has been restored and they can be released back to the sea.